Sil-Pro Medical Manufacturing Solutions creates medical silicone parts from start to finish in its Delano, Minn., operation. The company works with engineers to design the part, then create the molding, and then produce and inspect the part. By having all of these steps under its supervision in its own facility, Sil-Pro ensures control and accuracy. Many of these parts are implant devices for use in pacemakers, defibrillators and drug pumps, and they each require flawless finishes. Because its parts are complex and delivery times are sometimes within days, the company needs machines for all stages of its production process to be fast, consistent and accurate. For instance, medical-grade silicone has a high potential to flash during the mold process, so shutoffs must be precise down to 0.0001 inch. Venting and surface finish must also be taken into consideration because the material does not flow like plastic. When it acquired its mold shop, Sil-Pro also obtained a Makino S56 vertical machining center in the transaction. This equipment was faster, repeatable and had better accuracy than the other machines on the shop floor. The Makino S56 led the company to invest in more Makino machines for its medical manufacturing, specifically the V33, V22 graphite and EDGE2 Ram EDM. Not long after incorporating the Makino machines on the shop floor, the company was operating unattended with consistently accurate results. Flashing was eliminated, which brought cycle-time reductions of 25 to 40 percent while still achieving 4 to 8 Ra surface finishes and tight shutoffs. 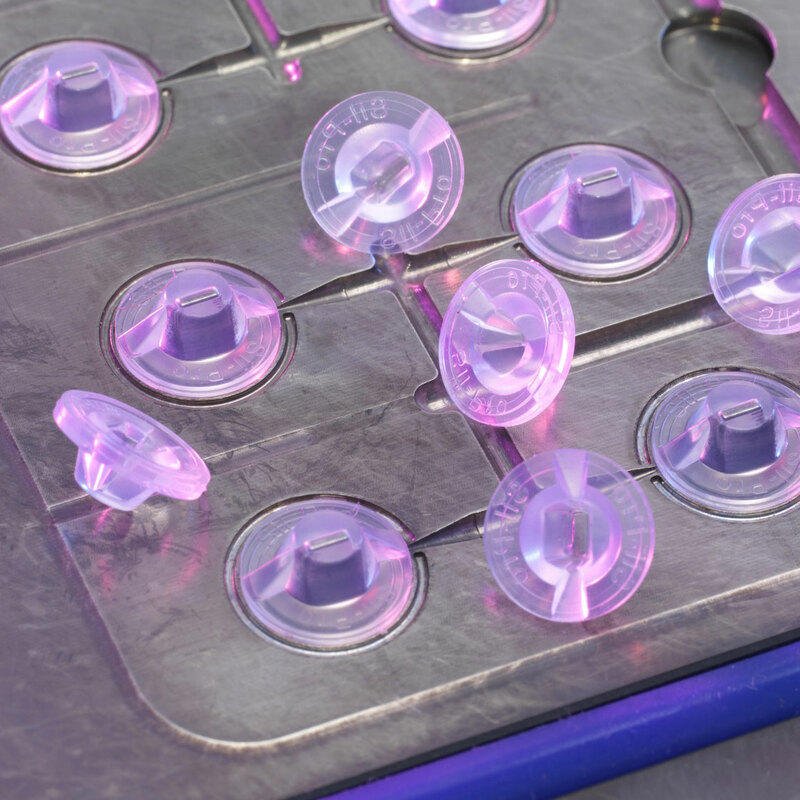 The surgical molds are completed in just one operation with the Makino machines. The equipment is reliable and consistent, and the molds come out perfect, needing no hand finishing. On features that cannot be milled, the EDGE2 is employed to create parts featuring deep ribs and sharp corners. The machines have become the lifeblood of Sil-Pro’s medical manufacturing operation, due to their speed and the finishes achieved. The machines help the company consistently meet the deadlines required by its customers.